Junction boxes are used to connect cables to add socket, lighting points, extend circuits etc. They can also be used to make repairs where a section of cable needs to be replaced. Junction boxes can be found as either round or square boxes, round ones are more common, square ones tend to be used for higher current cables. Junction boxes are rated in amps (typically 5, 20 or 30 amp). The size used should equate to the current rating of the circuit being connected into - you can always use a higher rated box than the circuit but never a lower rated box. For a lighting circuit use a 20amp junction box and for a ring main or radial circuit use a 30 amp junction box. 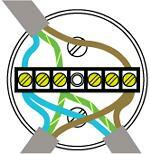 Junction boxes have 3, 4, 5 or 6 terminals and the number required depends upon the application. Single screw point terminal - as the name implies, each terminal has just one large screw which is used to secure all the cable cores being joined together. Bus Bar screw terminals - with these types of terminals, each cable core has its own location hole and screw for securing to a terminal. The number of cores which can be joined is limited by the number of holes/screws in each terminal - these can vary from 2 to 6. A problem when purchasing Junction Boxes is to know which type of terminal is fitted and, where Bus Bars are fitted, how many cable cores can be connected to each terminal. When using junction boxes to extend ring mains or radial circuits, remember that the regulations limit the length of cable for both ring and radial circuits, and also how spurs are connected to ring mains. These regulations must be adhered to to avoid possible overloading the electrical wiring. Junction boxes should always be fixed to a rafter, joist etc using screws through the holes in the back of them. They should always be accessible for electricians etc - they should never be buried in plaster or concrete. The outer cover of the cables being joined should be stripped back only as far as necessary and not beyond the outside of the box. Stripping the inner cores of the cable should be such that minimal conductor is exposed once the connection has been made. 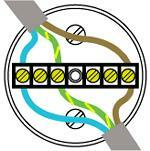 Each of the earth cores of the cables should be covered with green/yellow earth sleeving within the box. The cover should always be fixed in place using the screw (or screws) provided - the position of the internal wiring may need to be adjusted to allow the cover to sit on the body of the junction box before securing - never use the cover screws to force the cover down onto the cables, this can cause damage. Joining one length of cable to another. Connecting a spur - see right.